For professional HVAC service in Cincinnati, choose ElectricMasters. Has the time come to install a new HVAC system in your home or business? Is your HVAC system due for regular maintenance to keep it in great shape? Are you in need of an HVAC repair to get your system up and running again quickly? If so, look no further than ElectricMasters. We’re happy to say that there’s no better HVAC company to turn to for all of your residential and commercial heating and cooling needs, and once you work with our professionals, you’ll see why we’re your number one choice for great service. As a business owner, you know how important a comfortable environment is for every aspect of your business. If you own a store or an office where you host clients or customers, it’s important to create a welcoming, comfortable environment, which is difficult to do if it’s too cold or warm. But, even if you don’t see clients regularly in your workspace, in order for your employees to be as productive as possible, you need to keep the temperature at a comfortable level. Furthermore, when your HVAC system isn’t the right size for your space or if it is in need of repair or replacement, you could find yourself paying a lot more on your monthly energy bills than you would like. Having a reliable HVAC system is critical for businesses of all shapes and sizes, and for so many reasons. And, regardless of whether you need HVAC repair, replacement or maintenance, it’s important to hire the right company for the job. The good news is that, here in Cincinnati, you have ElectricMasters on your side, and we can provide you with the reliable commercial HVAC services you need when you need them. At the end of a long day, nothing quite compares to finally getting home, where you can really relax and unwind. But, if the temperature in your home isn’t ideal due to an HVAC issue, it’ll be a lot more difficult to let go of your stress and recover from the day. It may not seem like a big deal if your home is too warm or cool in the spring or fall, but when winter hits, a broken HVAC system can become a safety hazard. Additionally, not only do HVAC problems make your home uncomfortable, but they also lead to expensive energy bills. No matter what kind of HVAC issue you’re facing in your home, it’s important to know who to call to get it addressed quickly. At ElectricMasters, we offer a wide range of residential HVAC services, including maintenance, repairs, replacements and new installations. We have more than 20 years of service under our belts, and we’re committed to providing you with next-level customer service in everything we do. Keep your HVAC system running efficiently with regular maintenance. Stay comfortable – First and foremost, when your HVAC system is working properly, it can do its job more effectively, which is to keep your home comfortable for you and your family. Prevent the need for repairs – HVAC problems don’t often appear out of nowhere, and they also don’t fix themselves. With regular maintenance, small issues are corrected before they can turn into big problems that require pricey repairs. Extend the life of your system – Regular maintenance helps to prevent problems from arising that can shorten the life of your HVAC system. It also ensures that your HVAC system is running as efficiently as possible, which helps to keep it running longer. Protect your system’s warranty – Is your HVAC system under the manufacturer’s warranty? Most manufacturers require annual maintenance for their systems, and if you fail to keep up with the required maintenance, you could end up voiding the warranty. Protect your home – A broken HVAC system can be a dangerous thing for your home, and it can lead to further damage. For example, if your HVAC system stops working when it’s cold out, it could lead to frozen pipes that can burst and cause a lot of water damage in your home. Improve indoor air quality – According to the EPA, levels of airborne pollutants are between two and five times higher indoors than they are outdoors. This is especially troublesome if you or someone in your family suffers from a respiratory problem, like asthma. 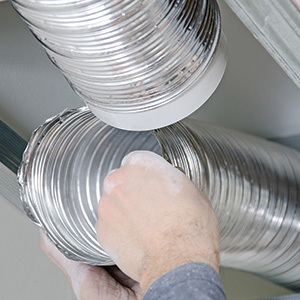 One great way to improve the air quality in your home is to get the ducts cleaned through HVAC maintenance. Save more money – There are so many ways in which preventative HVAC maintenance can help you save more money. 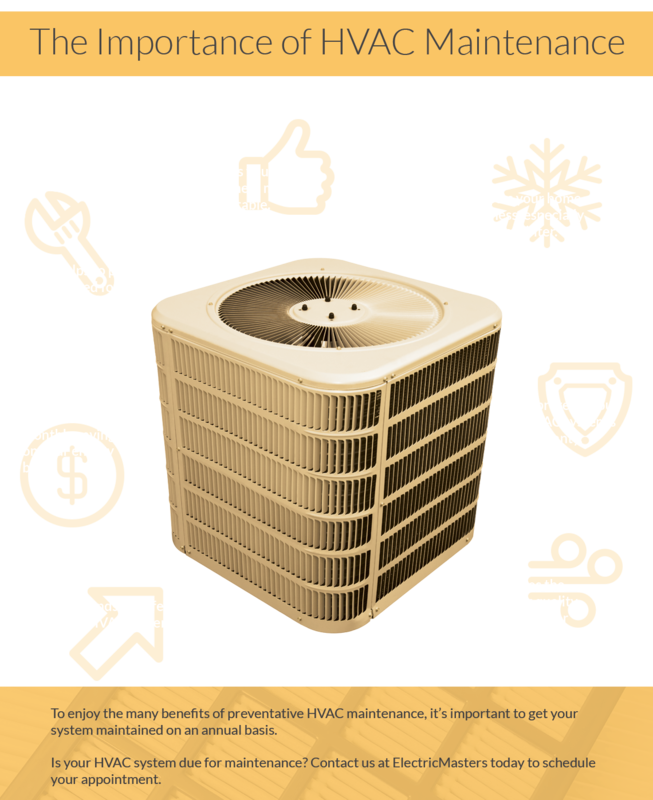 Because HVAC maintenance extends the life of your system and prevents repairs, it helps you save money. But the biggest difference you’ll notice, as far as savings is concerned, is with your monthly energy bills. Regular maintenance ensures that your system is running as efficiently as possible, which leads to monthly savings. There are so many reasons to keep your HVAC system properly maintained, and with ElectricMasters on your side, you won’t have to worry about doing it on your own. When to replace your HVAC system. Your AC is more than 10 years old and/or your furnace is more than 15 years old. Different aspects of your HVAC system have different shelf lives. For example, you can expect your air conditioner to last between 10 and 15 years, and your furnace to last 15 to 20 years. 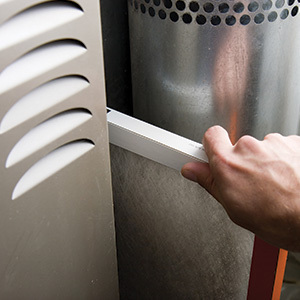 If your air conditioner or furnace is reaching the end of its life, and you’re facing a repair, you may be better off with a replacement than a repair. Your system needs repairs frequently. The last thing any homeowner or business owner wants is to have to keep putting money into HVAC repairs over and over again, and if it seems like your system is in constant need of repairs, you’ll save more in the end if you replace it now rather than if you keep repairing it. You can’t keep your home or office comfortable. At the end of the day, your HVAC system has one job — to keep your home or business at a comfortable temperature. And, if your system cannot perform that job, despite maintenance and repairs, then it could be the wrong size for your space or it might have been installed incorrectly. Either way, you’ll need to get the system replaced. Your indoor air quality is poor. In some cases, poor indoor air quality may indicate the need for duct cleaning or another maintenance task, but in some cases, poor indoor air quality can only be addressed with a new system. An old, outdated HVAC system can introduce excess humidity, dust, allergens and even mold into your business or home. You probably won’t notice allergens or excess humidity, but you should watch out for added dust throughout your home. Cases like these usually mean that the system is beyond repair. You’re facing an expensive repair. If you’re unsure about whether to get your air conditioner or furnace repaired or replaced, it’s time to consider the cost of the repair. In most cases, you’ll save more if you choose to repair your system rather than to replace, but if you’re facing a repair that’s more than half the cost of a replacement, you may be better off financially by choosing to replace your system. Have you noticed that your utility bills are always higher than you’d like them to be? Old and outdated air conditioners and furnaces have much higher energy requirements than the new models available today. In fact, air conditioners are, on average, more than 50 percent more efficient than air conditioners were just 10 years ago. And, while maintenance and repairs can help to improve your HVAC system’s efficiency, it still won’t be able to hold up to the efficiency of a new model. If there are blaring, aggressive noises coming from your air conditioner or furnace, it’s a sign that the system is coping with severe malfunctions. The blowers, fans, motors and countless other moving parts in your air conditioner should all work together smoothly, and any loud or jarring noises could indicate the need for replacement. While there’s nothing inherently dangerous about your air conditioner not blowing cold air, if the air conditioner has exposed or frayed wires, or if it’s leaking freon — which is a highly poisonous, lethal substance — it can quickly become dangerous. Further still, it’s also incredibly dangerous if your gas furnace is leaking or the pilot light has gone out. If you feel unsafe in your home due to any issues like these, get your HVAC system replaced as soon as you can. You’re preparing to sell your home. Are you getting ready to put your home on the market? If so, consider replacing your HVAC system, especially if it’s a little older. A broken furnace or air conditioner is a big expense that most prospective buyers are going to want to avoid at all costs. By replacing your HVAC system before putting your home on the market, you can gain a competitive edge that may help you sell it more quickly. If you feel that the time has come to replace your HVAC system, or if you’re not sure whether to get your system repaired or replaced, contact the professionals at ElectricMasters. Serving your best interests is the number one item on our priority list, and our experts can help you determine the right solution for you, your home or business and your checking account. From residential and commercial electrical services performed by certified electricians to HVAC maintenance, repair, and replacement services for your home or place of business, we are here to help you stay warm and comfortable. We want to be your go-to HVAC service providers in Northern Kentucky and Cincinnati, Ohio. For over 20 years, we’ve been providing exceptional electrical services along with our HVAC maintenance. No matter what commercial or residential service we perform, the fact of the matter is that no one does it like we do. We are licensed, experienced, and passionate about what we do. And although we understand that there are many HVAC companies out there for your to choose from, we make a point to affordably solve your issue the first time while doing everything we can to leave you satisfied. With just a $59 service call charge, ElectricMasters is a great choice for HVAC services in Cincinnati and beyond! Turn to ElectricMasters for HVAC service you can trust in Cincinnati. No matter what kind of HVAC service you need, or whether you need commercial or residential HVAC services, you need to hire the right HVAC contractor in Cincinnati, and that’s where we come in. We offer a wide range of services, including HVAC maintenance, repairs and replacements, so that we can meet all of your heating and cooling needs. The fact of the matter is that no other company can match our dedication to excellence, and you’ll see why we’re your number one choice when you work with our experts. HVAC Cincinnati – Why Choose Us For HVAC Maintenance!